This week I'm looking at a clipboard enhancement, Clips, from Conceited Software. Do you constantly find yourself moving bits of text and pictures between different applications? I do. Because I do so much writing it is often simple text and I've found the free utility Jumpcut completely adequate for this purpose. Clips, however, goes way beyond keeping a list of recently copied text snippets. So the question becomes whether additional functionality would be useful? Once you install Clips, it will silently begin keeping track of everything you add to your clipboard. It then categorizes and tracks those clips for future reference. 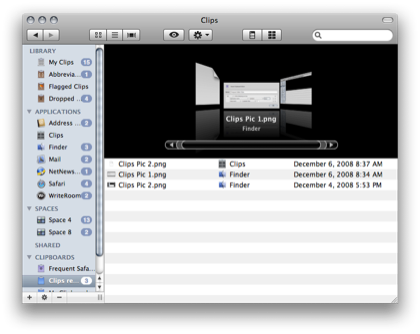 For instance, Clips remembers which application you were in when you cut or copied. So if I want to see all the clippings I made in Safari or my word processor, it is simply a matter of clicking the application in the Clips browser. If you use Leopard Spaces, it even tracks which space your clippings were made in. You can then search through your collection of clips easily with the live search. You can also create your own custom clipboards. I have one for MacSparky that includes some frequently used graphic and text assets. It even has a feature called "smart clipboards" that works very similar to smart rules in the Finder or iTunes. For instance, I made a smart clipboard that collects all clippings I've taken out of Safari more than five times. If you have clippings you use frequently, you can assign text snippets or key combinations. When you type in a certain text string, Clips will drop in the assigned link, picture, or text string. While TextExpander still reigns supreme for text snippets, this feature is useful for other assets. Once you have found your clipboard Nirvana, you can share your clipboards between multiple Macs. This is nice if you have multiple users or Macs. While it doesn't support MobileMe Syncing, that would be nice. For me, the most confusing part of Clips was the first time I loaded it. The application includes three separate interfaces. It has a Dashboardesque "Clips Board" which explodes onto your screen like the Dashboard. It also has a clips panel and clips organizer that works nearly identical to the Finder. There are also keyboard shortcuts and hot corners. My first reaction was, "Cheese and crackers! Clips just took over my Mac." It actually took me a little fiddling to realize that all of these interfaces give you similar information in different ways. In essence, the developer is giving the user the choice of figuring out what works best. Once I realized that, I tuned the interfaces to my liking and turned off several of the key combinations and hot corners and things have worked just swell since then. I was skeptical when I first started kicking the tires on Clips. I have been very pleased with my free Jumpcut and wasn't sure that I had any use for these fancy bells and whistles. Sadly, however, Clips has spoiled me and I will forever look at Jumpcut a little jaded. A Clips license will run £19.50. With the current exchange rate that brings the price up to nearly $29. While the application is very useful, that is a lot of money for a clipboard enhancement. Thankfully, the developer does offer a free trial period and I would recommend giving it a spin before buying. You can find it at www.conceitedsoftware.com. You can listen to this review on Surfbit's MacReviewCast #189.